In today's world, the need for infection control has never been greater. The patients and the health care professionals have become more concerned about the transmission of pathogenic organism then ever before. Controlling microbial contamination through sterilization has long been considered the most essential component of an infection control program. The result of proper instrument sterilization is the protection of the patient, and the health care professional from various infection diseases. The focus on infection control has sharpened. Since infections increase the severity of illness, complicate recovery, and prolong inpatient stays they raise the cost of care. The ever growing expense of health care has focused providers' attention on reducing costs. Often this means re-sterilizing and re-using expensive plastic items that might otherwise be discarded. Instruments must be sterilized between usage. There are several types of sterilization equipment. Steam sterilizers (autoclaves), dry heat sterilizers, heated chemical vapor sterilizers, and gas sterilizers. The dry heat sterilizers employ higher temperatures to destroy microorganisms. They are considered effective and safe for metal instruments because the process does not dull instrument edges or rust/corrode the instruments. There are two kinds of 'Dry heat sterilizers'. The traditional 'toaster oven' style that is slow and take an hour to sterilize at 320f (160c), or the COX Rapid Heat Sterilizer which is using a patented forced air and baffle system technology to sterilize in 6 minutes at 375f (190c). CDC guidelines calls for weekly monitoring the working of the dry heat sterilizer by doing a weekly spore test. Steam sterilizers will allow you to sterilize a wide range of materials. Temperature, pressure, and time are the main factors of this process. The higher the temperature, the greater the pressure and the shorter the sterilization cycle. Maximum temperature will rise to 273f (133c). Steam sterilization , however, may cause unprotected instruments to corrode and unprotected cutting edges to dull. Furthermore, excess water in the steam can provide a portal for microorganism to penetrate wet instrument packages. Steam sterilizers (autoclaves) are the most popular method of sterilization and are made and sold throughout the world. There are several steam sterilizers sold in the USA, and many more through the rest of the world. In the table top environment, chamber sizes ranges from 6" (15.24 cm) diameter x 14" (35.56 cm) deep, to 15" (38.1 cm) diameter x 26" (66.04 cm) deep. CDC guidelines calls for weekly monitoring the working of the steam sterilizer by doing a weekly spore test. 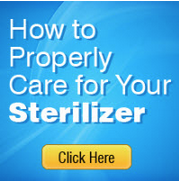 These type of sterilizers also offer relatively short cycle times. Metal instruments can be processed with minimal rust or corrosion, and cutting edges remain sharp; however, instruments must be dried completely before processing. The sterilizer requires a special solution; and heat sensitive plastics may be destroyed. In addition, the unit must be placed in a well ventilated area to diffuse the chemical odor. CDC guidelines calls for weekly monitoring the working of the chemical sterilizer by doing a weekly spore test. Liquid disinfectants, such as glutaraldehyde, are widely used in health care facilities. They have short, inexpensive disinfection cycles. However, gIutaraldehyde can not be used for all medical materials. Typical cycle times and concentrations only provide disinfecting, which can fail to kill resistant microorganisms. The solutions are highly corrosive and toxic; since they come in liquid form, they can not be used with barrier packaging. The moment an instrument is removed from the liquid, its sterility is compromised. Immersion in a liquid steriliant is not recommended because sterilization by liquid chemicals can not be monitored biologically. In addition, instruments disinfected by liquids must be handled aseptically, rinsed in sterile water, and dried with a sterile towel. Furthermore, instruments immersed in liquid sterilants are not wrapped and, therefore, must be used immediately or stored in a sterile container, according to the American Dental Association Councils on Scientific Affairs and on Dental Practice's "Infection Control Recommendations for the Dental Office and the Dental Laboratory," presented at the 1996 OSAP Scientific Forum. Glass bead sterilizer have long been employed for instruments re-used on the same patient at a single appointment; however, they are not suitable for terminal sterilization of instruments prior to re-use on other patients. The reason they are not effective is that there isn't a way to test the temperature throughout the cycle. In fact, glass bead sterilizers are not FDA approved, and any new machines must receive pre market approval, according to Dr. Janie Fuller with the infection control devices branch of the U.S. Food & drug Administration.